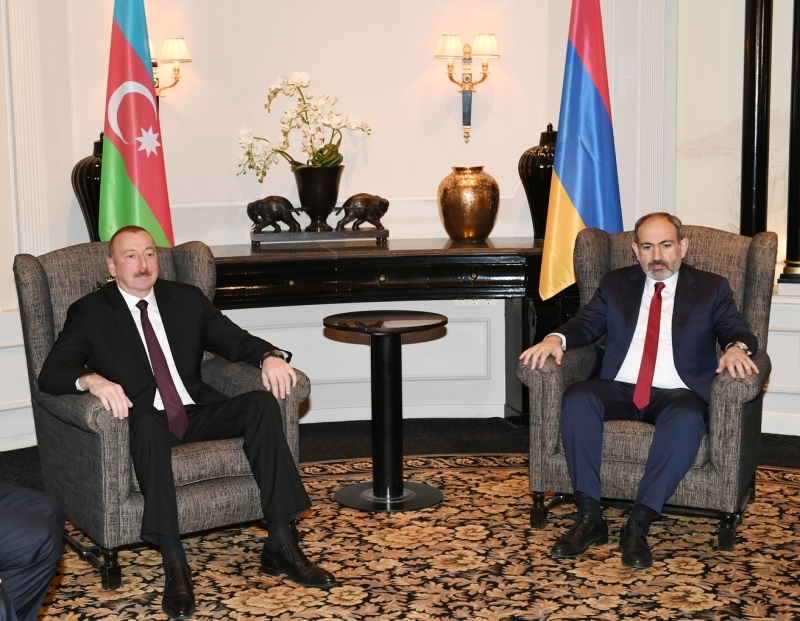 The betrayal of budding and faint hopes for a breakthrough in the resolution of the Karabakh conflict following the March 29, 2019 Vienna meeting between Azerbaijani President Ilham Aliyev and Armenian Premier Nikol Pashinyan bode no good for the South Caucasus in years to come. Defense Minister David Tonoyan has lain bare what Armenians have been repeating for centuries. We actually should thank him for not biting his tongue and opening our eyes wider in the face of the ever-growing threat to our sovereignty and existence as a nation. As an indirect response to a statement by the Azerbaijani Foreign Ministry whether Tonoyan agreed what he said in New York pertaining his new formula, that’s, intention to capture new lands, Prime Minister Nikol Pashinyan has also thrown away his mask and confirmed what all Armenians have been claiming. Unlike previous governments, the Pashinyan government is more treacherous and back-stabbing since he realizes that with no direct involvement in the occupation, he would risk everything if he makes any move towards de-occupation of the Azerbaijani lands under yoke of the Armenian fascists. Official Yerevan is gradually rolling back on democracy, human rights, freedom of speech pledges, restoring and cementing the previous status with regard to the Kremlin. The Azerbaijani government is increasingly losing hopes for the new Armenian premier as a reliable partner to strike a deal with. Pashinyan is going back to the policies of his predecessors and negotiating tactics. Azerbaijan, for its turn, is again scaling up pressure on Armenia but so far to no avail. And judging by the latest developments a new war is unavoidable as Baku has already realized that Pashinyan will not do anything further than his predecessors did. The longer Azerbaijan endures the occupation, the longer it aggravates its situation and destroys hopes for regaining the occupied lands. A war today may not start but it is unescapable tomorrow and we’ve have to win and reconfirm our status of the most powerful nation of the South Caucasus with the highest population and the leading economy. Armenia’s sabre-rattling should be provoked as casus belli since the Azerbaijani army, as the most powerful and prowess army in the South Caucasus, is thirst to begin the combat for the final and decisive blow to the Armenian occupation. “The negotiation process to resolve the Karabakh conflict should be continued, but as long as the problem is not solved, we, as a state and people, should be ready for any development of events,” Pashinyan told journalists on April 2. Pashinyan also claimed that "the statement of the minister in no way casts a shadow on the settlement process". One can, of course, speculate about intrigues in the Yerevan establishment and note that Nikol Pashinyan, perhaps, simply had no other choice. He couldn’t afford to deny David Tonoyan publicly; he couldn’t admit that Tonoyan went beyond his powers as it would accelerate his possible fall in years to come amid growing behind-the-curtain games of the Kremlin coupled with the Karabakh mafia in power structures in Armenia and across Russia. In Yerevan hopes are not also high for the political longevity of Pashinyan government and these claims have the right to exist. First, citizens of Armenia understand the internal political upheavals. Second, all these arguments have a solid admixture of conspiracy and admission. And third, and the “most important ones”, attempts to look for the cause in Yerevan intrigues of power are not canceled - and should not be obscured! The main thing is that the Armenian authorities are again threatening Azerbaijan and promising new territorial seizures. Moreover, not only the defense minister, but also the prime minister is doing this. That is, it’s about the position, and not about someone’s careless statement. Finally, everything is happening after the negotiations in Vienna. It is clear that the international diplomatic bureaucracy can lull itself with arguments that this meeting confirmed that the parties intend to resolve the conflict through dialogue. In Yerevan they make harsh statements, but this is nothing more than rhetoric for domestic consumption but in fact, everything is much more serious and dangerous. In fact, the meeting in Vienna marked the next foreign policy failure of Armenia. The very fact of continuing the dialogue in the same format, without the participation of representatives of the Xankandi occupying regime in the talks is already a very hard defeat for Pashinyan. Plus, the worst for him is still to come: the negotiations discuss the withdrawal of troops from the captured Azerbaijani lands. In Yerevan, they could still cherish the hope that after the disruption of the mediation mission of John Bolton, the settlement would go under the Russian “moderation”. According to the principle that Dmitry Medvedev stated several years ago: there is no need to change anything in the region, the main thing is not to shoot, so let them pass two, three, and even better - four generations, and then we'll see, or even with the presence of Russian peacekeepers. But have they ever thought in Yerevan about the degree of risk for themselves in the aggravation game underway in the region? The Armenian government unleashed a new and current phase of sabre rattling just on the anniversary of the April 2016 battles, which, we recall, ended for Armenia so sadly. Before that, David Tonoyan, then deputy defense minister, also threatened Azerbaijan with new territorial seizures. And the current adviser to Nikol Pashinyan, Arshak Karapetyan, the then chief of the intelligence department of the Armenian Defense Ministry, was engaged in analyzing intelligence information and knew well what the authorities should say so as not to say goodbye to the chair. They were in full confidence in Yerevan that they could not pay attention either to the growth of the Azerbaijani military budget or to the purchase of new weapons. Here they enthusiastically talked about the “unique fighting spirit” and generally felt like winners. Only now the hangover turned bitter. And today, hot on the heels of the current statements of Tonoyan, the Azerbaijani Foreign Ministry reminded: “The Armed Forces of the Republic of Azerbaijan are among the most powerful armies in the world and are able to liberate the occupied territories of Azerbaijan as soon as possible based on the relevant provisions of international law to ensure self-defense.” This boils down the below - if in Armenia, they decided to go to war, then let them think about the consequences. Nikol Pashinyan made his series of threats exactly after a telephone conversation with Russian President Vladimir Putin - on the “hot” results of the same Vienna talks with Azerbaijani President Ilham Aliyev. Russia has plenty of reasons and motives for the "game of aggravation" against Azerbaijan. The participation of our country in NATO exercises in Georgia, despite the irritation and shouts from Moscow, is an example, but hardly the only. Much more food for thought comes from the sensational congratulations of U.S. President Donald Trump to the Turkmen president and people, where Donald Trump calls on Ashgabat to begin transporting its gas through Azerbaijan - bypassing Russia. Azerbaijan’s Southern Gas Corridor project has broken Russia’s monopoly on the gas market in southern Europe, and if now Turkmenistan joins the SGC, it’s definitely not a “dream scenario” for Russia. Attempts to thwart all these very unfavorable trends from the Kremlin should be expected and if you are given the opportunity to do it with your hands and on behalf of your outpost... In short, reporting on the Vienna talks before Putin, Pashinyan obediently arranges a “series of threats”, and this is hardly just a nice coincidence. But that's the point. In 2016, in Yerevan, in the same way, they hoped for the intercession of Moscow. But for some reason, they did not win the territory cleared by Azerbaijan from the occupation of Armenia for Armenia. Today, the balance of forces has shifted in favor of Azerbaijan even more noticeably, Russia's position on the world stage has become even worse, which means that it has even less “freedom of hands”, the attention of the world community to Azerbaijan has also increased. Pashinyan’s phone call to the Kremlin boss alone is already a good reason to think about the degree of independence of both Armenia as a state, and Pashinyan as a politician and prime minister. And even more so, with the real political weight of his seemingly pro-Western statements back when he started street protests to dethrone Serzh Sargsyan. It is possible that Nikol Pashinyan saw himself as the head of the government of an independent state under Moscow’s complete control. But now, being in the desired chair, one cannot help but understand that, although he is referred to as the “prime minister”, in reality, he is nothing more than the head of the barrack service of the military base under the 102nd Russian base. So, he will have to pursue policies according to the principle “they have decided in Moscow - they have executed in Yerevan” with all predictable consequences for Armenia.